One thing I have noticed, though (much to my chagrin), is that it pretty much only works on the regular, Monday-Friday working commuter crowd. As soon as the weekend hits and you’re dealing with people that haven’t been bombarded with the stand on the right pass on the left mentality over the past few years, it totally falls apart (after all, you just need one person to not walk up the left hand side to block the whole thing). Still, though, a promising start. I think your point was probably that you wish that Shanghai people would stand to any side consistently, but I thought I’d point out that people stand on the right in Japan only in the Kansai region; they stand on the left in Kantō (and likely the rest of the country as well, but it’s always talked about as a Kantō/Kansai thing). That’s interesting; I never even knew there was that distinction. Most of the time I spent in Japan was in Kansai. I did a quick Google search and found that the “stand on the right” convention was supposedly implemented in Ōsaka just for the 1970 World’s Fair, based on a survey that found that most “first world” nations stand on the right. This failed to catch on in the rest of Japan. 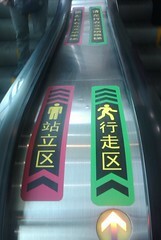 One of the things that most struck me about my visit to Taiwan was how Taiwanese stand on the right side of escalators and allow those in a hurry to pass on the left. They also give pedestrians right of way and give up their subway seats to the elderly, injured, and pregnant. It was like an alternate reality. Yeah, I hope that the behavior in Taiwan and Hong Kong are indications of where mainland China is headed. It’s really encouraging to witness a change, though, even if minor. You’re right, it’s a pleasant surprise that people follow the sign. Once I was hurrying in the subway, and it was like the Red Sea opening up. Sad to say, that this is just in the escalators; as I get pushed around a lot (in the buses and metros). I think that in the areas of China that I’ve been to, people do give up their seats to the elderly. Chengdu seems very polite in terms of transportation and I saw a young girl give seats to older people, and men readily give seats to pregnant women. Perhaps Shanghai is just ruder? Well, it would be unfair to generalize Shanghainese. However, chivalry isn’t dead here. People on the Taipei metro also stood to one side as early as 2004. The signs were there 2008-9 when I was in SH but there weren’t many adopters. 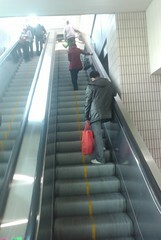 I have found that people obstructing the walking side can be made to move with a 让开！ and thumping footsteps if you are heading downwards. Perhaps they fear being trampled. On the way up, however, I have had no luck getting the way clear. I think that those of us that welcome the change should take it upon ourselves to ask the people that don’t follow the convention to move out of the way. By repeatedly asking them to move, in the long-term you’re instilling an awareness in them. Obviously, it takes a lot of people doing this for it to be effective, but I can imagine it happening. Interestingly, Seoul is running a series of PSAs in subway stations trying to discourage people from walking on the escalators at all. It would appear that the practice is rather dangerous and results in quite a few injuries each year. At the same time there is a nationwide campaign to get people to walk on the right in general. Not sure what the purpose of that is, but it sure has caused a lot of confusion over the past few months. Now let’s see how long it takes to get them doing the 先下后上/’off first on last’ thing on the metro. In my experience this is like John B said, it works during the weekday rush hours because those habitual riders have been socialized into it. But outside those times… passengers beware! Visiting Shanghai from Taiwan in 2006, I didn’t really notice the standing people clogging up both sides of the escalators. Maybe it’s because I was never in that much of a hurry. I did notice two things– one good and one bad. The bad thing was the awful wannabe rugby players trying to ram through me on their way into my subway car the instant the doors opened as if there were somehow a danger that letting me off the carriage would prevent them from boarding. The good thing was the pleasant absence of a “no drinks on the subway” rule. When it’s 35C and 100% humidity, it’s really nice to be able to take a water bottle on a long trip. In Beijing last summer, I noticed that people happily stood on the right and walked up the left–as long as you were at one of the bigger stations. Guomao, no problem. Dazhongsi, no way. Most people would make way if they saw that someone was in a hurry, though; both wai- and dangdis. I don’t think it’ll take long at all for this to catch on. Outside of Asia, this signature oriental practice has been adopted on the subway escalators of such far away locations as New York City. “Stand on the right” is a motto of the DC Metro as well on their escalators. Now, whether tourists (who the campaign is mainly aimed at) heed the warning is another thing. Many a tourist has been mowed down at rush hour for standing on the left. Taiwan is very good at this, Holland used to have no idea of this, which is especially annoying at the Amsterdam central train station. But recently the railway company has been running a campaign on a few stations, and in Leiden at least it’s working somewhat. Makes me feel all warm with hope for humanity when I see people stand on the right and walk on the left. New York is good at this too, but my friend from further west in the US promptly stood on the right when we took the metro there. And he had been in Taiwan too! it should be interesting to see how soon it will become a norm in most subway stations. Our subway system got in trouble for having “Stand right, walk left” decals because apparently the elderly get knocked down and hurt often because of people pushing past on the escalator. I’m not sure if they removed them (I’m not very observant) but I believe they had to. Funny, pretty much everyone assumed the stand/walk convention was a civilized accommodation between the rushed and the not.